From how we do science to publishing practices to the sociology of science, there isn’t an aspect of the scientific endeavor that isn’t in flux right now. Long-term readers of Jabberwocky know that understanding how the scientific endeavor is changing and figuring out how to maximize the good for science and minimize the bad is a bit of an obsession for us. Ethan has been a tireless proponent (or “a member of the radical fringe” as one former ESA president called him) for changes in scientific publishing and reproducibility. For me, the issue close to my heart is data availability. For me, this is a “for the good of science” issue. By definition, science relies on data. If data is stuck in a drawer and no one knows about it or it becomes technologically inaccessible (I’m looking at you 5 1/4” floppy disk) then it effectively does not exist for the scientific endeavor. At best it is knowledge that needs time and resources (neither of which we have in abundance) to reacquire. At worst that is knowledge lost forever. My colleagues were so against open-access data archiving that many said they would rather submit their science to a less high profile journal if publishing in a more high profile journal required them to archive their data2. The paper argues that this type of decision making will result in less impactful papers and harm the careers and funding opportunities for scientists studying long-term ecology. Fears were expressed that flawed science would be produced without the input of the PIs, that being scooped would damage the careers of their trainees, concern that time would get wasted due to redundant analyses being conducted as multiple labs do the same analyses, a reduction in the number of long-term studies due to lower incentives for conducting this type of science, less collaboration, and lost opportunities to obtain new funding because research is being done by other groups. You get the idea. Sharing data results in lost opportunities to author papers with cascading consequences. Having just published the next installment of the Portal Project long-term data and begun our on-line data streaming experiment, it seems like an ideal time to talk about my experiences and concerns with sharing long-term data. After all, unlike many people who have expressed these fears, my raw data3 has been openly available since 2009. How calamitous has this experience been for me and my students? Since the database was published in 2009, it has been cited 16 times. That’s about 2ish papers a year, not exactly an impressive flurry of activity – though you could argue that it would still be a significant boost to my productivity. But the picture changes when you look at how exactly the data are being used. Of those 16 citations, 4 cite the Data Paper to support statements about long-term data being published, 4 use the data as one of many datapoints as part of a meta-analysis/macroecological study, 3 use the data to plot a data-based example of their idea/concept/tool (i.e. the data is not used as part of an analysis that is being interpreted), 3 use the data to ask a scientific question focused on the field site, 1 cites the data paper for a statement in the metadata about the importance of experimental manipulations and 1 cites it for reasons I cannot ascertain because I couldn’t access the paper but the abstract makes it clear they are not analyzing our data. No one is going to add me a co-author to cite the existence of long-term data, cite statements made in the metadata, or make an example figure, so we’re down to 7 papers that I “lost” by publishing the data. But it gets even worse4. I am already a co-author on the 3 papers that focus on the site. So, now we’re down to 4 meta-analysis/macroecological studies. As someone who conducts that type of research I can tell you that I would only need to include someone as an author to get access to their data if I desperately needed their particular data for some reason (i.e. location, taxa, etc) or if I can’t get enough sites to make a robust conclusion otherwise. There is a lot of data available in the world through a variety of sources (government, literature, etc). Given the number of studies used in those 4 papers, if I had demanded authorship for use of my data, my data would probably not have been included. Final tally: We published one of the few (and among the longest-term) long-term datasets on climate, plants, and consumers for a single site in existence. This dataset even includes a long-term experimental manipulation (the ‘gold standard’ of ecology). That data has been openly available with no limitations for 7 years. I cannot yet point to an instance where someone used the data in a way that has cost us a paper – either through scooping us or because if the data had not been available they would have been forced to collaborate with me. In fairness, I don’t expect that to be true forever, but right now our challenge isn’t how to avoid being scooped, it’s how do we get anyone to use our data!!! When I talk about this data online or give talks, invariably people tell me “you are so lucky to have a data set like that”. My response: The entire world has a data set exactly like this because we published it! Not one of those people has published anything with it. Most people I know who are looking for data often forget about Dryad, so maybe Dryad just hasn’t been ‘discovered’. I would be interested to know how Evans’ result compares to data being downloaded from Ecological Archives. But given our experience with the open Portal Project data on Ecological Archives, I suspect differences in long-term data usage between different repositories is small. So, currently there is no evidence that publishing long-term data results in the negative impacts based on the Mills et al paper. Does it have a positive impact? For long-term data, I’m currently unclear because so few people seem to be using that type of data. But I have published some macroecological data sets in the past (Ernest 2003, Smith et al 2003, Myhrvold et al 2015) and there have definitely been positives for me. No, it has not resulted in papers for me, but I have also not been scooped on anything I was actively working on or even seriously interested in pursuing. But they have resulted in a fair number of citations (397 to date via Google Scholar), they contribute to my h-index (which universities use to judge me), and have definitely contributed to my name recognition in that area of ecology. (I have been tongue tied on more than one occasion when a big name walked up to me and thanked me for publishing my 2003 mammal life history dataset). No, these aren’t publications, but name recognition is ever harder to obtain in the increasingly crowded field of science, and citation and impact metrics (for better or worse) are increasingly a part of the assessment of scientists. So yes, I believe that publishing datasets in general has been a net positive for me. Finally, I can also say that NSF is watching. At the end of my previous NSF grant supporting the research at the field site, my program officer was in my ear reminding me that as part of that grant I needed to publish my data. I don’t know how other people feel about this, but I feel that a happy NSF is a positive. So, in my experience, publishing my long-term data has not resulted in the grand implosion of my research group. If anything, I think the relative dearth of activity using the long-term data – especially in comparison to the macroecological datasets – suggests that very few people are actually using long-term data. To me, this lack of engagement is much more dangerous for the continuation of funding for long-term ecology than the nebulous fears of open data. If people don’t actively see how important this type of data is, why would they ever recommend for it to be funded? Why prioritize funding long-term data collection – a data type most ecologists have never used and don’t understand – over an experiment which most ecologists do and understand. We need more advocates for long-term ecology and I don’t believe you can do that by tightly controlling access so only a lucky few have access to it. So if you’re wondering why we now stream the data nearly live on GitHub, or why we make the data available to be used as a teaching database for DataCarpentry, that’s why. Long-term datasets – and a large body of scientists who understand how to work with them – are going to be important in tackling questions about how and why ecosystems change through time (not just in the past but into the future). This makes increasing the number of people working with long-term data a win for science – and in the long-run I believe it will be a win for me and others who invest so much blood, sweat and tears into generating long-term data. 1 I have never had quantitative evidence before that I was not “normal”. My reaction was to give myself a pat on the back, but I couldn’t figure out if the pat was consolatory or congratulatory. 2 This language is drawn from the original paper and does not reflect my opinions on “high” vs “low” impact journals. 3 In the spirit of complete disclosure, this data is not exactly mine. I’ve collected a lot of it since 1995, but the site was started by Jim Brown, Diane Davidson, and Jim Reichman in 1977 and many people have been involved in collecting the site’s data. But I argue those expressed fears still apply to my case because when Tom Valone and I become the PIs of the project in the early 2000’s we could have opted to sit on this treasure trove of data instead of publishing it. 4 Worse depends on your point of view, of course. If you don’t want people to use your data, this is good news. I use worse here in the sense that this is bad news for the argument that publishing your data will cause you to lose papers. It is also worse from the perspective that we published this data and no one is using it. Updates on temporal community dynamics, and a whole new project scheme. Things have been quiet on the portal blog lately. But in the lab and the field, it has been anything but. Over the past year there have been big changes afoot for the Portal project. In the summer of 2015, Weecology lab headquarters relocated from Utah State University in small, mountainous Logan to the massive University of Florida campus in subtropical Gainesville. 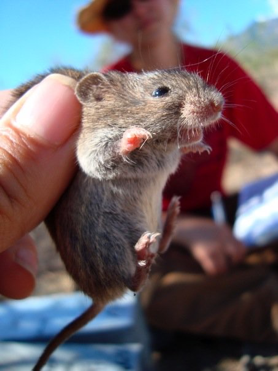 So now we study Arizona’s desert rodents from the mossy groves of the southeast rather than the alpine forests of the Rockies, like true cosmopolitan, ever-curious ecologists. A couple weeks ago, I posted about the new data paper from my long-term field site, the Portal Project. Most of you probably have no idea that there is also a blog associated with the field site that shares stories from the field and observations of interesting things going on down there. You’re forgiven for not knowing it existed because we have not been really good about posting on it for the past year or so. But we’re trying to change that! 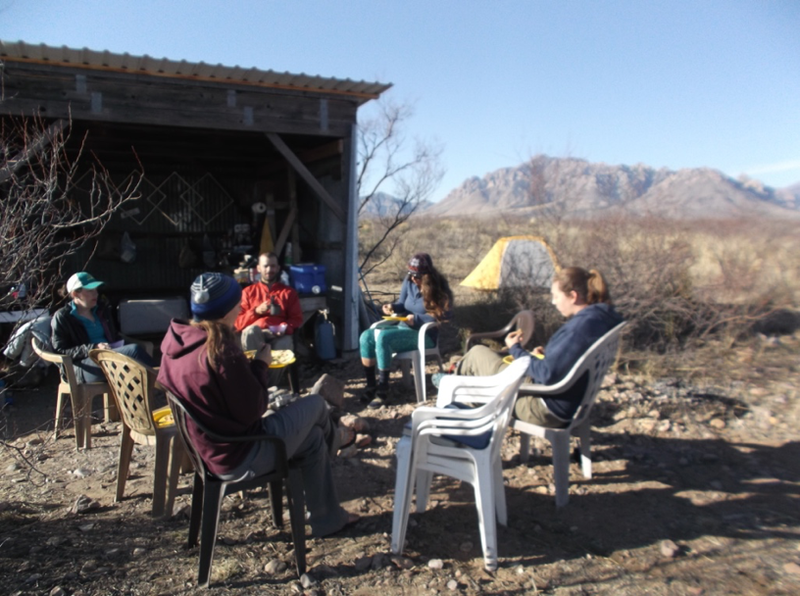 One of the things we really liked about the blog was that a mix of people used to follow it – some scientists, but also people who lived locally around Portal, AZ or had helped out down there at sometime over the past 30 years and were just curious to know what was going on. My student Joan Meiners, who has a strong interest in science communication, is helping out on the blog with some posts to help kickstart things. We’ll be reblogging some of the posts here as well. If you think they look interesting, click on the reblog to take you to the post on the Portal Blog. If not, just ignore! We’ll also highlight Portal Blog reblogs using the [PortalBlog] tag in the title. This is the story behind “Comparing process-based and constraint-based approaches for modeling macroecological patterns” by my former PhD student Xiao Xiao, James O’Dwyer, and myself. I was on sabbatical in the fall of 2013 and was doing a lot of reading, and I reread “An integrative framework for stochastic, size-structured community assembly” by James O’Dwyer, Jessica Green, and colleagues. A couple of months earlier Xiao Xiao, Dan McGlinn, & I had submitted a paper on “A strong test of the Maximum Entropy Theory of Ecology“, where we had tested John Harte and colleague’s new maximum entropy based model by looking at four different predictions of the model simultaneously. In rereading O’Dwyer et al. I realized that their size-structured neutral theory would probably be able to predict a similar set of ecological distributions to those predicted by the maximum entropy model. We’d already conducted the first three levels in McGill’s hierarchy of model testing (see McGill 2003 and McGill et al. 2006) for Harte et al.’s maximum entropy model (checking the general form of the predictions, comparing to null hypotheses, and testing multiple complex predictions) and this would let us complete the last level by comparing the fit to realistic alternative models. The math in O’Dwyer et al. is pretty advanced and I knew James through shared interests in ecological theory, so I emailed him and Xiao to see if it might it be mathematically tenable to use James’ model to make the same predictions we’d been testing and, if so, if he and Xiao were interested in working together on trying to do this. What resulted was a very interdisciplinary collaboration, combining shared expertise in mathematical modeling, computing, analysis of large ecological datasets, and knowledge of the foundations of multiple models/theories. It was regular for two of the three people to have a detailed conversation that the third collaborator didn’t follow the details of but always felt comfortable interjecting to make sure that the big picture goals of the project stayed on track. In particular, I remember a \~100 message long email exchange where James and Xiao were working on getting the two theories to make identical predictions. They were on-boarding each other with the details of the two theories and then exchanging ideas in math that I wasn’t even trying to keep up with. I’d occasionally jump in to provide some relevant empirical details and information on other related theory/ideas to help keep things moving in the right direction, but generally just got to watch in awe as two folks with amazing theory skills did their thing. Xiao was constantly running and sharing new analyses which really helped make all of our interactions cohesive by grounding them in graphs and real values. During the review process John Harte pointed out that there was a second generation model from the maximum entropy theory that was expected to improve the areas where the version we were analyzing was performing poorly. We’d known about this work for a couple of years since we’d been actively sharing ideas and results with the Harte Lab throughout this research. We knew that this paper was already in review, but it didn’t seem like we could reasonably analyze work that they hadn’t made publicly available yet. So, we’d acknowledged in our paper that new models based on this general theory could improve it’s performance and planned to potentially come back later and analyze the new model in a second paper. Aside: this is a perfect example of the advantages of preprints for facilitating a rapid scientific dialog. If this second generation paper had been posted as a preprint at the time it was initially submitted for review we would have been able to cite and analyze the new theory from earlier on in the process of working on our paper. In fact, we probably wouldn’t have had any choice because good reviewers would have pointed us to the preprint and told us that we needed to address it. Without a preprint and with the paper still in review we could have easily told the editor that we couldn’t address the new model yet, and in fact the editor explicitly gave us that option. This would have made for a quick and easy acceptance since all the other comments involved only writing, but it arguably wasn’t in the best interests of moving science forward quickly. The new model would either be published first, or shortly after our paper, which would mean that the answer to the overarching question would have been very much up in the air. So, it would be better to add the new model to our analyses, but it would take a lot more work to do so. We would have to implement a new model from scratch, integrate it into our code base, and then rerun all of our fairly time-consuming analyses. Xiao was a newly minted PhD and James was an untenured assistant professor, so the best career strategy for them would have been to just get the paper in as is. This was particularly true for Xiao who was going to have to do the majority of the work getting the new model implemented, so we left the decision in her hands and made it clear that everyone was happy with either choice. She decided that the extra work was worth it to better answer the core question now and not only added the 2nd generation maximum entropy model, but also a more advanced version of the size-structured neutral theory model that she and James had been working on. This also broadened the scope of inference for the paper because we had now evaluated two models from each theory instead of just a single model. It is with great glee that I can announce the latest release of the Portal Project Database. For those of you who just want to go play with the data – here’s the link to the Data Paper we just published in Ecology. But I would encourage you to read on, as there is more data-related news below. As some of you know, I manage a long-term ecological study: the Portal Project. It was started by Jim Brown, Diane Davidson, and Jim Reichman back in 1977 to study competition and plant/animal interactions. That original team moved on (intellectually) and eventually retired. Tom Valone and I inherited the mantel of responsibility for the site. Jim Brown believed in sharing data with whomever asked for it, and in 2009 we formalized that philosophy by publishing all of the data from 1977-2003 that we felt was in good enough shape to document and share. We chose to release the data as an Ecology Data Paper, using Ecological Archives. Partly that was because I had great previous experiences publishing data through Ecology, and partly because I wanted something permanent. I’ve seen many people talk about their “publically available data” that was either not actually publically available, stored on a now-defunct personal website, or had so many data owner imposed hoops to jump through that it was effectively not public. I wanted the data to be available even if I died (a little grim, I know, but a real consideration when we talk about data archiving). But we kept collecting data, which meant in 2013 we realized we had an additional 10 years of data we could share. We also had cleaned up and documented additional data that we wanted to add. So we started the process of publishing the next chunk of data. But how should we do this? Should we just add on to the existing Data Paper (assuming Ecological Archives allowed this it would be awkward since the title of the original data paper included the words 1977-2003)? We also decided to add all the graduate students who had been funded to collect the data for the project from 2003-2013, but tracking down people from the 1970s and 80s seemed unfeasible. The short version of the story is that we opted for a separate data paper for 2003-2013, but Ecological Archives wanted a new Data Paper with all the years of data in one place – so that’s what we ended up doing. Our new Data Paper contains all the data in the original Data Paper, plus the new years of data, plus old ant and weather data that we felt we now understood well enough to let loose in the world. It should come as no surprise to those who follow this blog that we here at Weecology are interested in open science. I love Ecological Archives as a permanent repository1 – the data is safely in the public sphere even if I die, change universities, forget to update my website, or hand the research over to someone who doesn’t share my ideals. But publishing new data papers is a big ordeal that I only want to do every few years. If we want to make data available more rapidly (and we do), we needed another mechanism for delivery to the public. Thus begins the Portal Project GitHub Database experiment. Version 1.0.0 (which is currently available) matches what is available on Ecological Archives and can be reached through this link: https://github.com/weecology/PortalData/releases or by clicking the release button on the main page of the repository (see above). When will new data be released? Our aim is to release a new vetted and updated version approximately every 6 months. However, you can also get our most up-to-date data from GitHub. You can find it on the main page (see figure above). As part of this process, we have moved our data entry and quality control processes to center around the Portal Data repository. Yes, that’s right, you’ll be able to access our new data as soon as we’ve entered it from our field datasheets. New data has not gone through the same level of quality control – so user beware. That data will be less stable than the release data. This gives you all the commit messages that are associated with changes to this file. Maybe one of these catches your eye. You can see exactly what got changed by clicking on it. The red shows you a row that has a deletion. The green a row that is “new”. How do we feel about this shift to GitHub? We were very nervous about this initially. While the White Lab has some serious Git-Fu skills, the Ernest Lab views itself as field ecologists and GitHub is not exactly intuitive to us. We worried we would screw up the data. We worried we were adding complexity to an already complex quality control process. But so far we are really happy about our new system. By integrating data entry into the data publishing process, it insures that we are always providing updated data, even if we’re slow on official releases. Version control is allowing us to document all the changes being made to the database – and everyone involved with the project has a chance to see the changes and comment on them if they have concerns. And everyone in our group (and now the world) has access to the most up to date data (and can choose between extremely current but still being vetted for errors or less current but more stable and less error prone). We’re not alone in taking this step to using GitHub for data management; other examples of projects that have moved to GitHub include the Biomass and Allometry Database for woody plants (BAAD) and the Open Tree of Life. I want to end by saying that I don’t currently intend to stop submitting major updates to Ecological Archives or some other permanent repository. What GitHub provides is more transparency on how the data is being managed (both for people within and outside our group) and faster data streaming to other scientists than we’re capable of doing through Ecological Archives. But what it doesn’t do is provide the data in a stable way for ecologists in the future – and that is something we take very seriously! So if you only want to use our data via Data Papers, never fear, you now have all the data through 2013 and more will come eventually. But in the meantime, you might want to check out our data repository. 1 I might love it a little less right now since my data files are ‘Wiley Property’ housed on Wiley servers, but that’s a separate blog post. We are very exited to announce the newest release of the EcoData Retriever, our software for automating the downloading, cleaning, and installing of ecological and environmental data. Instead of hours or days trying to get complicated datasets like the Breeding Bird Survey ready for analysis, the Retriever lets you simply click a button or run a single command from R or the command line, and your computer does the rest. It’s been over a year since the last retriever release and there are lots of new features and improvements to be excited about. We’ve added 21 new datasets, including major ecological and environmental datasets like eBird, Vertnet, and the Global Wood Density Database, and the PRISM climate data. To support all of these datasets we’ve added support for additional data types including greater than memory archive files, and we’ve also improved the ability to control where downloaded files are stored and how they are clustered together. We’ve significantly improved documentation and now have a new automatically built documentation site at Read The Docs. We’ve also made a lot of under the hood improvements. This is also the first release that has been overseen by Weecology’s new software engineer, Henry Senyondo. We’re excited to have Henry on the team, and now that he’s around development of both the EcoData Retriever and other lab software projects will be happening more quickly. A big thanks to the Gordon and Betty Moore Foundation’s Data-Driven Discovery Initiative for funding this development through Grant GBMF4563 and to the National Science Foundation for funding as part of a CAREER award to Ethan White. Trait Databases: What is the End Goal? For the past few years I’ve been involved in a collaboration to put together a broad-coverage life history database for mammals, reptiles, and birds. The project started because my collaborator, Nathan Myhrvold, and I both had projects we were interested in that involved comparing life history traits of reptiles, mammals, and birds, and only mammals had easily accessible life history databases with broad taxonomic coverage. So, we decided to work together to fix this. To save others the hassle of redoing what we were doing, we decided to make the dataset available to the scientific community. While this post started out as a standard “Hey, check out this new publication from our group” post (Here it is, by the way: Myhrvold, N.P., †E. Baldridge, B. Chan, D. Sivam, D.L. Freeman, S.K.M. Ernest. 2015. An Amniote Life-history Database to Perform Comparative Analyses with Birds, Mammals, and Reptiles. Ecology 96:3109), I’ve realized that there’s something more important that needs to be discussed: what is the future of trait databases? Trait databases are all the rage these days, for good reason. Traits are interesting from evolutionary and ecological perspectives: How and why do species differ in traits, how do traits evolve, how quickly do traits change in response to changing environment, and what impacts do these differences have on community assembly and ecosystem function. They have the potential to link individual performance with local, regional, and even global processes. There’s lots of trait data out there, but most of it has been buried in papers, books, theses, gray literature, field guides, etc. This has led to the explosion of compendiums compiling trait data. Some of these are published as Data Papers (e.g. 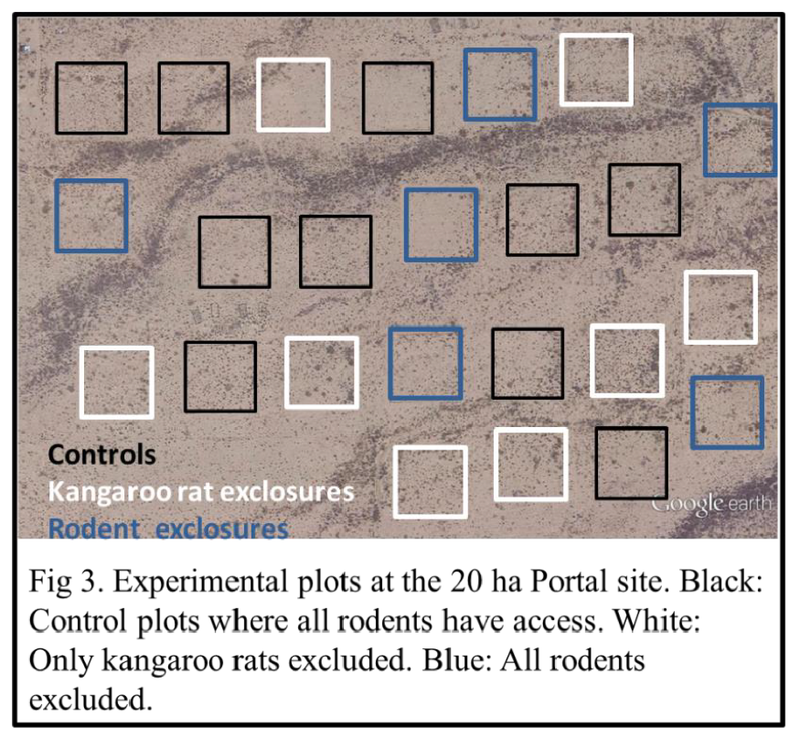 : Mammals: Jones et al 2009 , Plankton: Kremer et al 2014) or on-line databases (e.g. AnAge, FishBase), which are open for everyone to use. Many of these open datasets are generated by a small number of scientists to address some particular question. Some are quasi-open/quasi-private resources generated by consortiums of scientists (TRY). There are a variety of issues regarding these trait compendiums, not least of which is these trait compendiums pull data from numerous sources, but how do data generators get credit and what type of credit is reasonable? This is a doozy that I don’t have an answer to. Instead, my focus today is on the eventual endgame of trait databases. No trait database currently being produced has all the trait data of interest for every species. This means we have a bunch of incomplete data products running around. So, every few years, a bigger – more complete, but still incomplete – trait dataset is produced for some group of species. Sometimes the bigger dataset replicates the effort of the smaller one, sometimes it incorporates the smaller compilation whole-cloth, sometimes they have little overlap in sources whatsoever. Data compilations vary in the ease of use and accessibility. Some databases are widely known, some are known only to a few insiders. I could keep going. Clearly this state of affairs is less than optimal for rapid progress in studying traits. So what’s the end game here? What should we be doing? In my opinion, what we need is a centralized trait database where people can contribute trait data and where that data is easily accessible by anyone who wants to use it for research (not just to the contributing members of the database). It would also be nice if people who contribute significant amounts of data (no, I’m not going to define that here) could get specific credit for that contribution – maybe as a Data Paper or E-Publication. To encourage people to not just download data, add to it, and then sit on the expanded dataset, embargoes could be put in place to allow people to add their data to the dataset but have the data protected for a limited period of time to allow that researcher to get first crack at the publications using that entry. It’d be really nice if people who use the database could easily download all the references for the data they used so it can be easily incorporated into a literature cited section. The central database could get credit (let’s face it, it needs to be able to justify the funding that such an endeavor would require) by having people register papers published using data from the database. They could then keep track of numbers of pubs and citations to those pubs to help track the database’s impact. Right about now, my Paleo brethren may be thinking “this sounds suspiciously familiar”. I’ve pretty much lifted this list right off of the Paleobiology Database website (https://paleobiodb.org/#/faq). While ecologists have been running our every database for itself experiment on Trait Databases, the Paleobiologists have been experimenting with collaborative open databases for fossil records. I’m an outsider, so I don’t really know how the database is perceived within the paleo community, but from the outside I have been a big fan of the database, the work that has emerged from its existence, and the community that surrounds it. Which is why I’ve wondered if ecology could some something similar. But if we’re going to do this, I think we need to copy something else from the Paleobiology Database: a focus on individual records. Currently, many trait databases focus on a species-level value; what is the average number of offspring per litter? Seed Mass? Average body size? This is a logical place to start building a database if many of the questions are focused on comparing central tendencies across species. But our understanding of traits and the questions we want to ask have evolved. Having any info is still better than no info, but often we need info on variability across individuals within a species or we want to know how the trait might vary with changes in the environment. For this, we need record-level data. By this, I mean that instead of pooling observations to obtain an average for a species, we now often want to know that the average litter size for a species at location X is 3 but 8 at location Y. 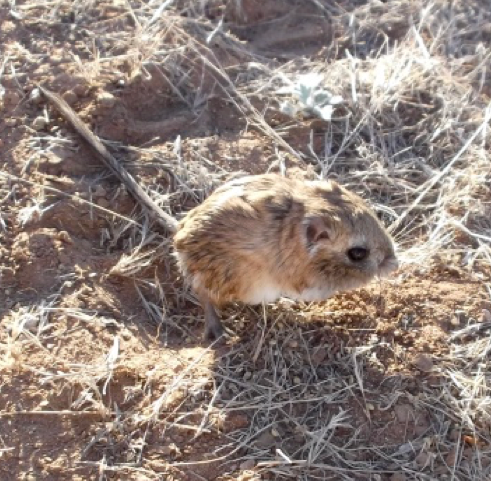 For some species, traits are especially sensitive to temperature or some other environmental variable – so knowing if the body size was measured at 28C or 32C can be important. This data could then be summarized in whatever way the user needed (species-averages, region-specific averages, etc). This, of course, is the hard part, because while we have an increasing number of trait compilations, they have either jettisoned the record information, or little of the record info is associated with the datapoint except maybe the citation name (I say this knowing I’m guilty of this). It also involves doing some form of georeferencing if we want the location info to be useable (like they’ve been doing for museum records). This means we would need to basically uncompile the compilations – find the original citations, extract as much info as we can from them, and then re-enter them as part of a more sophisticated database. This is an extraordinary amount of work that (to be clear) I am not volunteering for. There are undoubtedly some in the trait community who are about to explode because they’ve been thinking “but we’re doing what you are talking about!”. There are indeed already some bigger initiatives out there (AnAge, FishBase, TRY) but they are either not community-based (i.e. run by a closed group), taxon-centric, or a nightmare of open and closed policies that make extracting data needlessly burdensome, or some unfortunate combo of the above. The one that seems closest to the Paleobiology Database model is TraitBank at the Enyclopedia of Life. Its goal, however, is different from the record-based trait database that I outlined above. Its goal is to have a webpage (and trait data) for every species on the planet, so this still seems to be a species average approach. As I mentioned before, some info is better than no info, so this alone would be a huge benefit to trait research, but still carries the restrictions of species-average values. On the plus side, data in the database is available for everyone to use and each data entry has the specific reference listed with it. But I don’t think it’s had broad buy-in from the trait community. TraitBank only lists 50 data sources and 327 “content partners” (websites/databases that have agreed to share their data via Encyclopedia of Life pages). Admittedly, these sources are some of the biggest data aggregations around, but it’s inconceivable that they cover the wide array of trait info for all of life. Without broad buy-in from the trait community, both using it for research and contributing their data to it, I don’t see this working in the way I’ve outlined above. So where does this leave us? Well, things are currently in a muddle with respect to trait data, but there’s also tremendous opportunity for someone who can envision the type of database the field needs, sell broad swaths of the trait data community on its importance, and figure out how to build both the database and the community to support and use it. This may involve better community buy-in with TraitBank and/or some new initiative working on a record-level product that would allow a finer-level of question to be asked. The question is how does this happen and is there enough will in the trait community to give up on the current idiosyncratic ad hoc approach and contribute to something with broad trait and taxonomic coverage with an open data policy? Recently, over at the blog Ecological Rants the eminent ecologist Charles Krebs wrote a post about the ills of simplification in ecology. The post focuses specifically on how ecology has been ‘led astray’ by simplified models and lab studies. This has recently been picked up on Dynamic Ecology by Jeremy Fox who responded generally to the post but specifically to the affront to microcosms. I strongly recommend you check them out for yourself and not just rely on my version of events. I agree with a lot of this paragraph, though my perspective on it is different. 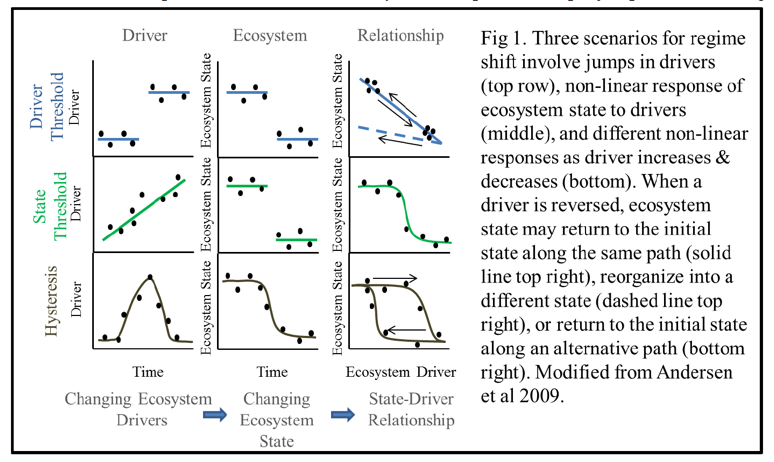 I agree that our focus for much of the past 60 years in community ecology has been on equilibrial dynamics at a specific spatial scale with limited understanding on the impact context (i.e. what patches are near what other patches) can have on the local community. Does this make it difficult for us to predict what will happen in the dynamic world we actually live in? Yes. But unlike Krebs I don’t see the past few decades of research as a waste. We’ve learned a great deal about the fundamentals of ecological systems – species interactions, food web structure, biodiversity, niche partitioning, colonization, extinction, etc etc etc – all with the help of microcosms and simplified theory (and field studies and macroecology). We needed those decades of work to understand the basics of how communities are structured under idealized conditions. Left: A child’s line drawing of SpongeBob’s Squidward. 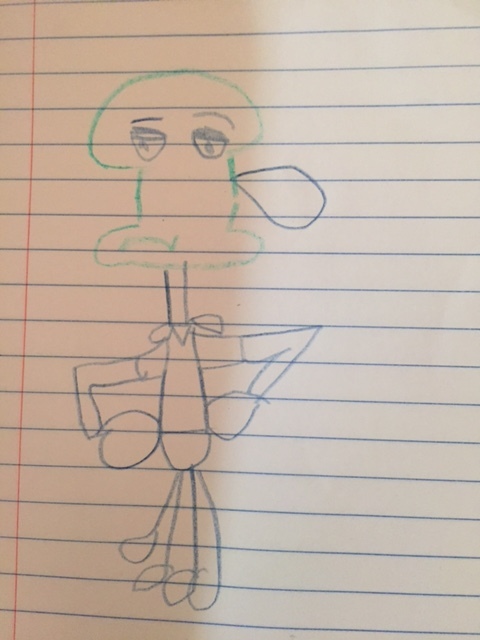 Right: Squidward.Does the drawing capture the essence of squidward? I’m biased, but I say yes. But how does a child get to being able to create a reasonable facsimile of something without first learning how pencils work, how they respond to hand movement, and how to simplify an image but still make it recognizable to others? I think this is also true with ecology. How do we know how to reasonably abstract a complicated system down to its most important components without first understanding what the components are and how to convey them in simple understandable ways? Now, our challenge is to take what we have learned and apply it to the more complicated scenarios that are happening in nature (i.e. how does our Squidward change as he interacts with the dynamic setting of Bikini Bottom*). How do ecosystems change through time? 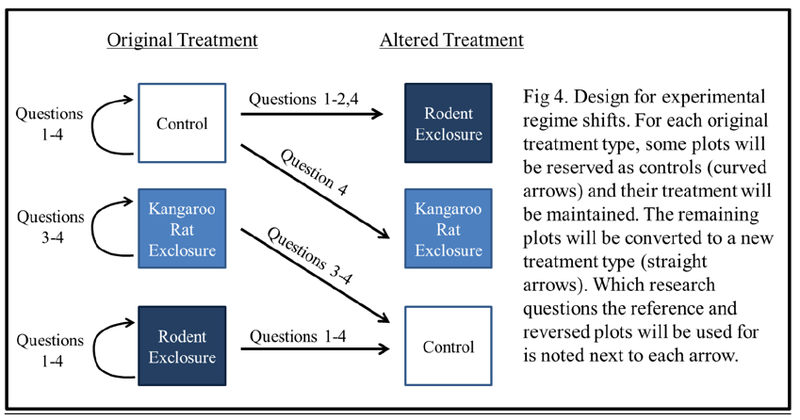 What is the role of species interactions, context-dependence, and processes at different spatial and temporal scales in driving (or ameliorating) changes in food webs, niche partitioning, etc? These are pressing questions for our society as we try to predict how nature will respond to human perturbations, but these are also important for the basic development of our science. Some of this work will be done through detailed case studies out in the field, but some (hopefully) will be done with the help of theory, controlled experiments, and data-intensive approaches like macroecology to generate generalizations that help us know how to think and predict likely responses and scenarios. The danger that I think Krebs is concerned about is that we become so attached to our clean, simplified view, our polished theories, that we refuse to engage with the more complicated scenarios. For example, if long-term studies suggest that the focus on equilibrial communities is misplaced, it would be to our detriment to continue to focus only on equilibrial communities in our theories and experiments. However, I don’t think this is happening (or if it was, I think momentum is shifting). Landscape ecology, metacommunity theory, biogeography, are all areas where people have been actively studying the very spatial issues Krebs bemoans us neglecting. I think he is more accurate about community ecology shying away from rigorously thinking about temporal dynamics, but I have a whole post on that planned, so I’ll spare you my rant. That we are starting to think about these more complex issues is what makes ecology exciting right now (and frustrating and really really hard). We have a grasp (tenuous, maybe, but a grasp nonetheless) on the fundamental, general concepts that bridge across ecosystems and organisms. We have more data, better tools, and better theoretical constructs than at any time in the past. 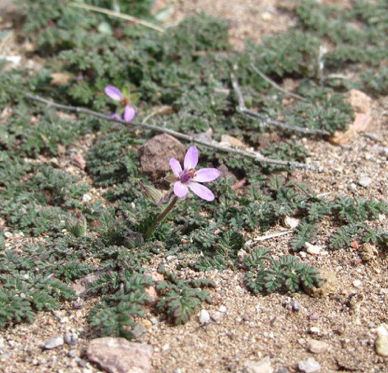 Now is the time to tackle these more complex questions and to do so will require all the scientific approaches available to us – that includes field ecology, macroecology, theory, and, yes, microcosms. *Yes I have been forced to watch too much SpongeBob lately.